"Something is coming, that is far beyond you and I..."
For some of the time during this rather long movie, I felt rather bored, but most of the time, I was excited, and more importantly, amazed by the visual spectacle of an epic event brought to life. I had fun following the unfolding events, although some plot details are better left untouched for a more compact, fast-paced, awesome film. The film started well with an action scene and a potential rivalry building, but then slowed down for up until the first hour. I felt bored during those moments more than most, and admittedly, I checked my watch a few times. It is the only setback I felt of the whole film because what follows, is some awesome spectacle. The middle part was the best & most exciting part, as I was left in intense suspense & awe of the amazing visual effects, of the plagues brought to life. And somehow, I felt sympathy for the people, including main antagonist Ramesses himself (I give full credit to Joel Edgerton for bringing to life such a relatable & emotional character). 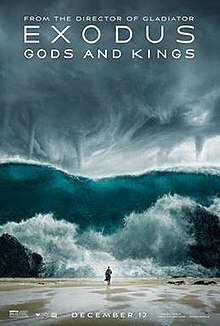 I was immersed in the world since then, and from there onwards, it was only the wait for the final epic moment in the Red Sea. In between is just Moses' struggle in finding a way, and Ramesses' getting hell bent on revenge. I was rather surprised (slightly dissapointed though) with the climactic moment in the Red Sea. The ending was more of a necessity, but didn't feel satisfactory enough. So in the end, there were moments that just dazzled and make me lost in words, but others were just boring plot points, some of which could have been removed. My full credit is for Ridley Scott for such an amazing work, especially on how much effort is put into the details, that brings to life such an amazing world and epic event that it centers on. Acting-wise, Joel Edgerton is the only one that took me by surprise and was beyond amazing. Action sequences were story-driven, meanwhile no comedy as I recalled in a film so dramatically-toned. Not really good & bad aspects, more of a amazing moments & some boring moments.